The Fellowship was fortunate enough to obtain a copy of SAUCER STATE #1 from IDW Publishing. Paul Cornell writes, Ryan Kelly draws, Adam Guzowski colors, and Simon Bowland letters. Before she ran for President, Arcadia was abducted by aliens. This is her secret, and now that she’s in the White House she’s trying like mad to learn anything she can about UFOs. But in the world of politics, there are no secrets, at least not for long. And who knows – maybe something else will push her secret out into the light of day. Politics is a topic that is much on the minds of readers these days. And it’s a big part of this story, but it’s not the heart of the story. 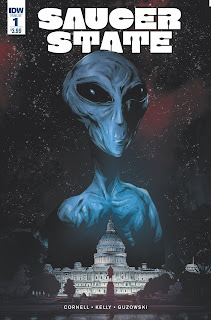 Arcadia is not the stereotypical alien abduction victim – she’s President of the United States, she’s rational, and she knows there’s something going on. I love how layered this story is, and the art has a realistic feel that really contrasts the “less realistic” stuff very well. This is a story that does the political drama well and adds interesting layers around it. It’ll be cool to see how Madam President handles the situation. SAUCER STATE #1 is available now from your local comic shop, or online at idwpublishing.com.